The Poughkeepsie Journal is a newspaper based in Poughkeepsie, New York owned by the Gannett Company, which bought the paper in 1977. Founded in 1785 (though not a daily newspaper until 1860), the Journal is the oldest paper in New York state, and is the second-oldest in the nation. The Journal's primary coverage area is Dutchess County, though the entire Mid-Hudson Valley is covered in some form, along with some coverage of points south via the White Plains-based Journal News. Throughout its existence, the Journal has been a paper of historical significance given the various events in the Poughkeepsie area. For example, in 1788, the editor of the Journal was the official reporter of the ratification of the United States Constitution by New York in that year (the event itself occurring in Poughkeepsie, which was the state capital at the time). The paper also served as a launching point of stories during the Franklin D. Roosevelt administration when the President was at his estate in nearby Hyde Park. In the book My Side of the Mountain, the Journal was mentioned under its name at the time, the Poughkeepsie New Yorker. 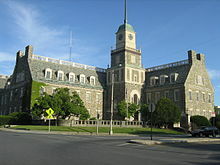 The Journal's main office is a fieldstone Colonial Revival building on Civic Center Plaza, the north end of Market Street in downtown Poughkeepsie. It is listed on the National Register of Historic Places. Though the Journal has been published for over 220 years, it has not published under the Journal nameplate for the whole of its existence. The evolution of the names of the paper is as follows. 1960: Poughkeepsie New Yorker returns to the "Journal" name to commemorate the paper's 175th anniversary. ^ "Total Circ for US Newspapers". Alliance for Audited Media. March 31, 2013. Archived from the original on March 6, 2013. Retrieved June 30, 2013.